It 's very interesting to compare this 2014 box of concerto recordings with Maurizio Pollini and Claudio Abbado from 2016. Obviously, they are two very different artists (speaking only of the pianists), but there is a lot of overlap. Take away the 20th-Century works from the Pollini set, add the Mozart here, and the boxes have identical repertoire. Pollini 's box has multiple versions of the Brahms, while Backhaus has multiple versions of all the Beethoven concertos save for the first. This is an import from Italy, by the way, but Amazon is handing these out through sellers for about 20 dollars. Besides, it 's not been easy to acquire the bulk of these recordings recently. The Backhaus-Pollini comparison actually works well for the Beethoven. Some critics hold these men in high regard as Beethoven players, and some do not. But whereas Pollini 's early Beethoven is to be preferred, I lean towards Backhaus ' later stereo readings with the underrated Hans-Schmidt Isserstedt. The earlier (monophonic) readings with Bohm and Krauss find the Vienna Philharmonic in its postwar form, which is to say not especially polished. Still, these recordings – last seen on Testament at full price – have their admirers, and certainly the younger Backhaus plays better from a technical standpoint than his much older self. In all three cases (Pollini, older and younger Backhaus) critics have pointed out that there is a slight lack of emotional engagement and dynamic attention, and I can certainly agree. 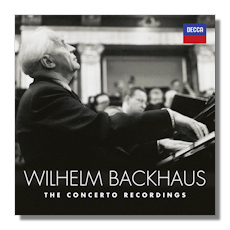 However, Backhaus always brings a seriousness of purpose and unquestionably musicality to every one of these recordings. Collectors will be happy to have them again. The Brahms First is in mono, the Second in stereo. The latter finds the Vienna players in beautiful shape, and Bohm is at his very best and un-stodgy in this music. It 's a lovely reading that stresses beauty over Richter 's thunder. Backhaus was in his 80s here, but the commitment and ability to communicate the music is stronger here than in his somewhat younger Beethoven recordings. It was coupled on Decca Legends with the Mozart, which is just as beautiful and makes one regret that there 's not more to savor. That Brahms First Concerto is pretty fine, though it 's never gotten the attention of that magnificent Second. Wand conducts the Schumann, in a rare outing for Decca, and it 's a good reading that again recalls Pollini in the sense that it 's good but not outstanding. Still, we don't know how much longer labels will keep handing out these historical box sets, so I suggest that if you 're a fan of Backhaus who 's tired of waiting for Decca to do him justice on the international level, pick this box up for a reasonable price.